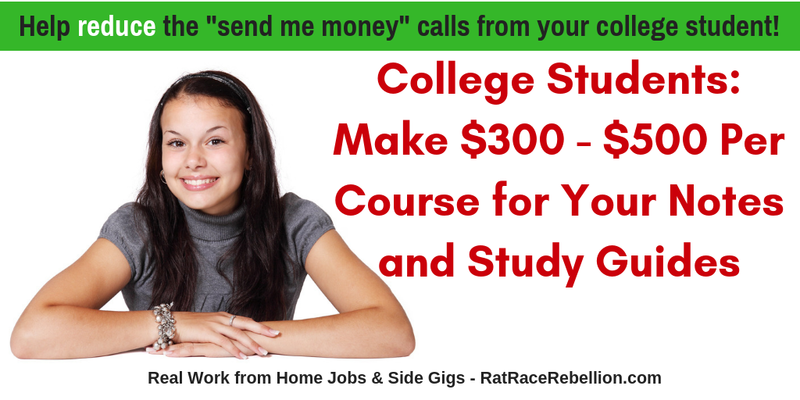 If you have kids in college and you’re getting too many “send me money” calls, check out a way that will help them make some money for doing something they should be doing anyway — taking notes in class! StudySoup is looking for Elite Notetakers! Earn $300-$500 per course for your notes while helping your classmates. Plus you get a guaranteed base pay just for participating. Their top Elite Notetaker earned $2,306! See her video testimonial here. They find top notetakers and pay them to post their notes/study guides to help their classmates study. College costs keep going up, so here’s to options that help put a little cash back in students’ (and parents’) pockets! Click here to register. For more, see their FAQ here. For more jobs like these, check our Newest Jobs & Gigs page. To be the first to hear about jobs like these, like our Facebook page. Good luck in your next steps toward working from home!